Usually a fan of citrus scents, there’s something about the shift in the seasons that has me craving more decadent delights these days. And they don’t come much sweeter and more indulgent than this honey and tropical flower infused shower gel from Lush. Originally released as a limited edition product for Valentine’s Day this year, It’s Raining Men is back by popular demand and both looks and smells good enough to eat. It’s a creamy golden colour that smells like honeycomb and caramel and vanilla – utterly delicious, in other words. I really like this product. It’s not super moisturising but it doesn’t dry out my skin and it lathers up well. The scent lingers, but not in an overpowering, fighting-with-my-perfume kinda way. And the name never fails to put the Weather Girls song in my head and a big smile on my face -- no easy feat first thing in the morning, believe me! It’s Raining Men can be picked up at any Lush shop at €5.35 for 100g, €9.95 for 250g or €18.75 for 500g. Nuxe Fondant Body Scrub: This creamy body scrub with almond and orange flower petals smells divine, with a sweet nutty fragrance. It contains different sized botanical extracts like walnut shell powder, orange zest and lichee stone extracts that gently exfoliate for soft, smooth skin that feels like new. I love it on its own but as I'm running out, I’ve recently been blending it with my shower gel and It’s Raining Men works perfectly for this purpose. The Body Shop Coconut Body Butter: Rich, creamy and intensely moisturising, it’s no wonder The Body Shop’s butters scooped the prize for best body lotion at the recent Beaut.ie Best In Beauty Awards. The coconut version contains both shea and cocoa butter as well as a coconut oil derivative, and it smells just as good as that sounds. Oriflame Tender Care Protecting Balm in Caramel: Tender Care is a multi-purpose balm with beeswax, to soothe and moisturise dry or rough areas. This caramel version is colour free but smells delectable, and comes in an adorable caramel coloured pot. I use it mainly as a lip balm but sometimes on my cuticles or elbows, too. Have you tried any of these products? And what type of scents do you usually prefer? And while we're on the subject, have you entered my giveaway for €100 worth of delicious honey scented NUXE products? It closes Friday, so be quick now! I love, love, love Lush and this showergel sounds gorgeous. My fav Lush showergel is The Olive Branch, it smells divine. 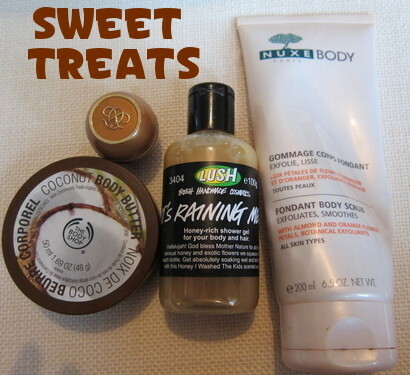 I'm a huge fan of The Body Shop Body Butters and the Oriflame Balm sounds lovely. Thanks Paula - I will definitely give the Olive Branch shower gel a try, this is my first Lush shower gel and it is so delicious that I'm considering trying it over ice cream! Thanks Dawn - I've tried a few Oriflame products recently and I really like them. Never tried anything from Oriflame either, where are they stocked? You have an interesting line of products here. I tried to look for them in our local stores. I can't find them. Where did you get yours? By the way, awesome skin care reviews!